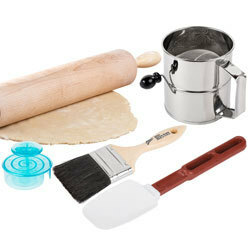 Stock your bakery with baking hand tools and utensils. You’ll find rolling pins, scrapers, cutters for cakes and pies, and slicers for candy. 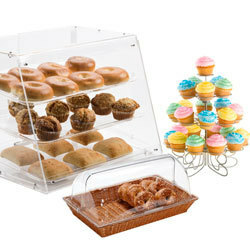 Enhance the presentation of your baked goods with these display stands. We offer everything from cake stands and pastry baskets to display cases. 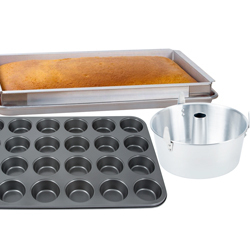 Bake your cakes, pastries, breads, rolls, bagels, and other baked goods with our professional baking pans. 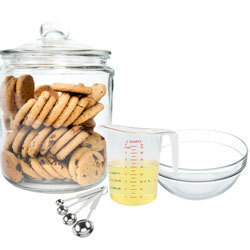 Outfit your bakery with the proper measuring tools. We carry measuring cups and spoons as well as mixing and measuring bowls. 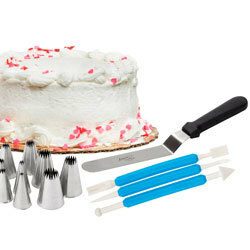 Add detailing to your cakes, cookies, and pastries with our decorating tools. Stock up on items like pastry bags, pastry tubes, and icing spatulas. If you’re looking for baking smallwares for your foodservice establishment, then you’ve come to the right place. Whether you operate a small, local bakery in town or a large catering business or supermarket bakery, we’re sure to have the products you need. Plus, by stocking up on these items in bulk, you’ll receive great wholesale prices that you can’t find anywhere else. While you’re shopping for products for your bakery, be sure to also check out our commercial mixers, holding cabinets, and bakery convection ovens. If you're wondering where to buy baking smallwares, we have a large selection of baking smallwares for sale at the lowest prices. Aluminum, aluminized steel, carbon steel, non-stick...with so many muffin and baking pan options to choose from, it's a wonder how anyone has time to bake their petite treats! Thankfully, we created this handy guide to break down the types of muffin and baking pans to make this purchasing decision easier than cake. If you operate a bakery, then be sure to stock up on the baking smallwares you need to properly prepare baked goods. You’ll find measuring tools and ingredient bowls for preparing batters, as well as cake pans and molds for baking cakes, cookies, and other desserts. We even carry merchandising items, like pastry baskets, cupcake stands, and sample dome trays, that help boost impulse sales. By outfitting your kitchen with the proper baking smallwares, you can create delicate baked goods that not only taste delicious but are visually appealing, as well. Use pastry tips, bags, and fondant smoothers to intricately decorate cakes and cupcakes, and stock up on pie cutters to serve equal portions of cake in your bakery or at your special event. Also, don’t forget bakery smallwares, like bagel boards, candy scoops, pan extenders, and draining grates, that make your preparation processes more efficient.